Samsung C&T, an affiliate of smartphone maker Samsung, has approached Somika to buy cobalt produced at its Kisanfu mine in the DRC. Samsung C&T (KRX:028260), an affiliate of smartphone maker Samsung (KRX:005930), is in talks for a multi-year deal to buy cobalt from a miner in the Democratic Republic of Congo (DRC). Samsung C&T has approached Somika to buy cobalt produced at its Kisanfu mine in the DRC, sources told Bloomberg on Tuesday (March 13). The company has been buying copper from the Congolese miner for four years. Somika Chairman Chetan Chug confirmed the news, but did not provide further details as negotiations are still ongoing. “We typically do one year, maximum two years, and ensure we optimize the cobalt pricing,” Chug said. Samsung C&T joins technology giant Apple (NASDAQ:AAPL), which is also looking to secure long-term supply of cobalt directly from miners. German automaker Volkswagen (FWB:VW) has been looking to secure long-term deals without success, while BMW (ETR:BMW) is said to be close to signing an agreement for lithium and cobalt supply. Cobalt is an essential element in the lithium-ion batteries used to power electric cars and smartphones. However, smartphones use only about 8 grams of refined cobalt, while electric cars use over 1,000 times more. That’s why many believe concerns from smartphone makers are linked not only to security of supply but also to ethical sourcing of the metal. More than 50 percent of cobalt comes from the DRC, the world’s top cobalt-producing country, where mining has been associated with human right abuses. 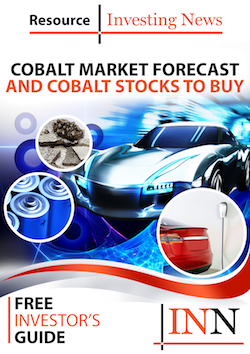 Many analysts believe that buying cobalt directly from miners could be a way for carmakers and technology companies to ensure responsible sourcing of the metal. “I think this will be one of many solutions to cleaning up the cobalt supply chain, not everyone is going to be able to source material directly from a mine, so there will still need to be a lot of work around the supply chain and within the DRC itself to raise standards across the board,” Benchmark Mineral Intelligence analyst Caspar Rawles told the Investing News Network.